You are currently browsing the The Pet Product Guru blog archives for January, 2018. 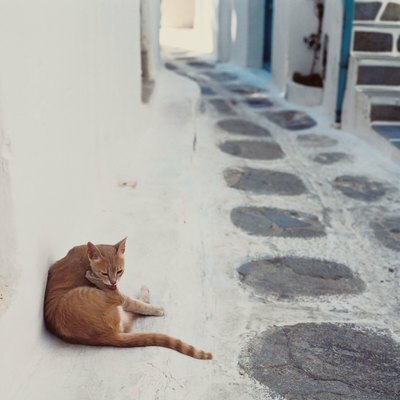 Can Feral Cats Spread Disease? Lately there has been a feral cat who comes to our porch everyday for food and water. My cat Millie waits for him by the sliding doors everyday and gets very excited when he makes his way to his food bowl. She taps at the door hoping to get his attention and jumps up and down. She wants me to open the door so she could official “greet” him. I am very leery of letting Millie come in physical contact with him. Nest.com has put together a list of infections that can be transmitted by feral cats to other cats and humans. The following information is taken from nest.com. He’s handsome, but take him to a vet before you bring him home. It’s tempting to welcome a stray cat into your house if you notice one hanging around. Before making the decision to open your home to a new cat, or even to provide a little food in a dish outside, you may wonder about the health impact of your decision. FIV, the feline equivalent of HIV, and FeLV are both immunodeficiency diseases: they damage the immune system of the infected cat, making it difficult for him to fight off diseases. Feline leukemia, though not a cancer itself, is so named because it also increases a cat’s risk of developing certain cancers, including leukemia. Both diseases are ultimately fatal, though affected cats may remain symptom-free for some time. Humans are not affected by these diseases, but obviously any other cats you have will be at risk if you bring an infected stray into your home. It’s critical to have a vet give a new cat the OK before introducing him to your little pride. Toxoplasmosis is contagious to humans, and is a particular concern for pregnant women and those with a compromised immune system. It’s an infection from the parasite Toxoplasma gondii, which is found in cat feces. For most people this illness is no big deal, and in fact there’s a good chance you’ve already contracted it without knowing it—many healthy people show no symptoms. Those who do usually get headaches, fever, sore throat, muscle pain and enlarged lymph nodes, though people with compromised immune systems may have more serious symptoms. Treatment isn’t usually necessary, but when given consists of antibiotics and antimalarial drugs. Bartonellosis is also known as cat scratch fever or cat scratch disease. Although most people are acquainted with the term “cat scratch fever” as it refers to humans, cats can also infect other felines with this disease. One cat can infect another through licking, sneezing, spitting or biting in addition to scratching. Symptoms of bartonellosis infection in cats include a high fever, conjunctivitis, pneumonia, swollen lymph nodes and bronchitis. Symptoms of the disease in humans include fatigue and fever, similar to having a cold or mild case of the flu, headache, swollen lymph nodes and the development of pimple-like bumps on the scratch site. While medical treatment is typically not needed, people or cats with compromised immune systems may be given antibiotics. Ringworm is a fungal infection that can be transmitted from cat to cat, as well as from an infected cat to dogs and humans. Symptoms of ringworm include circular spots of patchy hair loss, because it’s not actually a worm—it’s a fungus. It isn’t necessary for the cat to have close contact with others to spread ringworm. The disease can be transmitted through contact with infected food dishes or bedding. Ringworm spores can remain active for up to one year, making this a difficult disease to eradicate once it’s established. Rabies is a common concern with strays because of the nearly 100 percent fatality rate. Areas that have large wild animal or feral animal populations are more likely to harbor animals with the rabies virus. Rabies is most often transmitted through the bite of an infected animal, but any exposure to the saliva of an infected animal can lead to transmission. Don’t approach any animal that appears hostile or disoriented, or is otherwise acting strangely, but also remember that an animal may be rabid for some time before it starts showing symptoms—meaning that any bite is cause to make an appointment with your doctor. All that said, don’t panic: with prompt attention after a bite, rabies is totally preventable with just a few shots in the arm. Thanks to nest.com for providing this valuable information. Keep the best music on all day at work. We transport you back in time when life was simpler. Download the free Edgewater Gold Radio app. 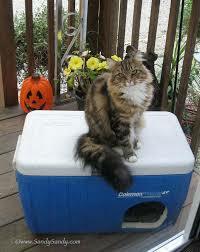 add comment Comments Off on Can Feral Cats Spread Disease? Sometimes instead of fostering a child,foster parents choose to foster an animal. These foster parents take in shelter dog and cats that are ill, not socialized or not yet weaned and turn them into healthy, loving, adoptable pets. By providing temporary homes, foster parents enable shelters to take in more animals than they would otherwise have room for. So if you have the time, space and love to share with a foster pet, contact your local shelter or rescue group. If your application is approved, you’ll attend training sessions to learn how to socialize, house train and maybe even bottle feed your foster pet. The hardest part of fostering is giving up your foster pet. After you buy all of the supplies, they are hard to let go of but you are doing a wonderful service by providing shelter and care for a sheltered pet. LISTEN TO OUR ONLINE OLDIES RADIO STATION – EDGEWATER GOLD RADIO—-THE GREATEST OLDIES OF YOUR LIFE! Listen to all of your favorite oldies and standards from our website: Edgewatergoldradio.com! Download the free Edgewater Gold Radio app! The illness, also known as CI, is a highly contagious viral infection that can hit dogs and cats. It is a Type A influenza virus and two strains have been found in the U.S.: H3N8 and H3N2. Dog flu can be transmitted through droplets or aerosols with respiratory secretions from coughing, barking and sneezing. Dogs in kennels, day care facilities and shelters are at higher risk of infection. The virus can be viable on surfaces for up to 48 hours, on clothing for 24 hours and on hands for 12 hours. H2N8 has an incubation period of one to five days as clinical signs show two to three days after exposure usually. The H3N2 strain has an incubation period of two to eight days. The morbidity rate of the illness is 80% and the mortality rate is about 10%. Canine influenza virus infects and replicates inside cells located in the respiratory tract from the nasal lining to the terminal airways, causing rhinitis, tracheitis, bronchitis and bronchiolotis. Dog flu usually causes respiratory problems and it can happen during any time of the year as there is no dog flu season. Take your dog to the veterinary if he shows symptoms of a canine influenza as treatment can help eliminate the illness in two to three weeks. LISTEN TO OUR ONLINE OLDIES STATION – EDGEWATER GOLD RADIO FOR THE BEST VARIETY OF OLDIES ANYWHERE! The best variety of the 50s, 60s, 70s 80s, and great pop standards are on Edgewater GOLD Radio – it’s radio like you remember it in the 60s and 70s. Download the free Edgewater Gold Radio app now! Dogs Can Get The Flu Too! We’re in the midst of a deadly flu epidemic sweeping the country and even man’s best friend is not immune to the flu. Canine influenza A H3N2 virus, or dog flu, was identified in the U.S. in 2015 and has infected dogs in nearly every state since then. 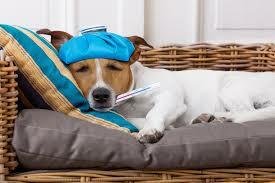 Dog flu is different from the flu the affects humans. Just as the flu spread by close contact, dog flu is spread when dogs bark, sneeze or cough at each other or come in close contact. Dogs at kennels, dog parks or boarding facilities have the biggest chance of catching the flu. Officials at Cornell University’s College of Veterinary Medicine reported cases of dog flu across the country. Their research, done on a voluntary basis, currently shows several active areas of transmission in the U.S.: southern Ohio and northeastern Tennessee as well as the San Jose and greater San Francisco Bay areas. 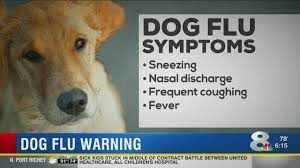 It’s unpredictable how this happens and really depends on when a dog who has been exposed to influenza gets introduced to an environment where the virus can easily spread,” said Dr. Amy Glaser, director of Cornell’s Molecular Diagnostics Animal Health Diagnostic Center. Symptoms are similar to humans and include a persistent cough, sneezing, reduced appetite, discharge from the eyes and a high fever. If your dog is showing any symptoms, take him to the vet right away. He’ll get tested and if the test is positive, he may be given a prescription to fight off secondary infections and fluids to restore hydration. Thanks to ABC news for provided some of this information. 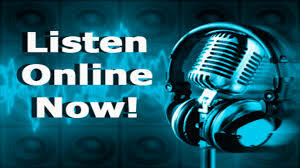 Listen to our online radio station Edgewater Gold Radio for the best variety of oldies and standards. Listen from our new Edgewater Gold Radio Website and download the free Edgewater Gold Radio App today! add comment Comments Off on Dogs Can Get The Flu Too! The first step is picking the right sitter for your dog. My first choice would be someone that I know and my dog knows and trusts. That’s half the battle. This person should be able to balance and calm your dog down if he is nervous. I would not suggest, leaving a dog who is a bit hyperactive with an elderly relative. The Pet Sitter should understand the needs of your dog. The best thing to do is to have the Pet Sitter, come to your home, stay there while you’re away and maintain the dog’s daily routine. Keep the walking, feeding and sleeping schedule the same. If you have to leave your dog at another location, make sure that you get him familiar with the surroundings. May several trips to the new location. Make sure that he’s comfortable before leaving him. If you choose to leave your dog with a family member, make sure that they know the whole routine. For example, if your dog is used to a one hour walk in the morning, a fifteen minute walk won’t do it. Leave a checklist for the Pet Sitter, include important information like your phone number, the vet’s phone number and address and the nearest 24 hour animal hospital. If there are any medications, leave very detailed instructions on how the medication should be administered as well as the frequency and time. Also, make sure the Pet Sitter knows how often to check the dog water bowl. It should be filled at all times. Note any behavior issues like whether or not you allow the dog on the furniture. Inform the sitter as to when the dog should receive a treat. If you follow these tips, just relax. Your dog will be in good hands while you’re gone. It’s a good idea to check in with the sitter every few days if you’re going to be gone for an extended period of time. You’re invited to feel the best memories of your life! Music to help you get through your day – It always helps. Edgewater Gold Radio, our online oldies station, plays the largest variety of oldies plus great pop standards. Listen from our new Edgewater Gold Radio website and download the Edgewater GOLD Radio app! Stomach acid in cats can be a problem just as it is in humans. Certain diseases such as Kidney disease can cause an over production in stomach acid and can cause your cat to vomit. My cat Molly has advanced kidney disease and usually spits up mucus in the morning. I asked my vet about medicine to help with the acid and vomiting. 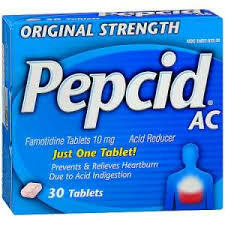 He prescribed 10 mg of Pepcid. One quarter of a tablet once or twice a day. I’ve been giving her one quarter of a tablet in the morning and one quarter tablet in the evening and it seems to be helping a bit. 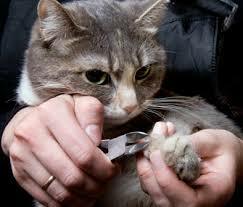 Always consult with your vet before administering any over the counter medications to your pet. You may be doing your pet more harm than good! Oldies for your workday or any day—Edgewater Gold Radio—listen on your mobile device, download the free Edgewater Gold Radio app, listen on Tunein, Nobex, Live 365 and may other places! How Many Fingers and Toes Does Your Cat Have? Polydactal is a fancy word for extra fingers and toes. Polydactal cats are known for having paws that look like big mittens. Because Ernest Hemingway’s cats are famous for their extra toes, polydactals are sometimes referred to as “Hemingway” cats. 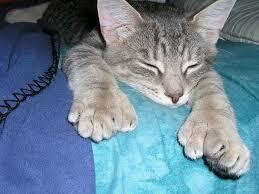 Normal cats have four toes on each paw. As well as a “do” claw on each front leg. The polydactal cats can have up to seven toes per paw.The extra digits are usually in the front but sometimes all four paws are affected. The defect is an inherited genetic abnormality. It’s generally not a problem for the cat. However, owners of polydactal cats do have their work cut out for them when it’s time for a toe nail trimming. Keep plenty of cat toys on hand to occupy your cats attention while trimming all of these toes. We invite you to our new Edgewater Gold Radio website where you will hear the best variety of oldies from the 50s 60 70s 80s and great pop standards! Listen all day, download the free Edgewater GOLD Radio app and pass the word along! The best music is on Edgewater GOLD Radio! add comment Comments Off on How Many Fingers and Toes Does Your Cat Have? My partner works in a hotel where there is a Macaw in the lobby. Over the past two years the bird has gotten very attached to him and he has also gotten attached to “Peanut “the bird. We were talking about someday adopting our own Macaw and it’s still on the table, sort of. First I want to thank Animalbliss.com for providing the following very helpful information on the Macaw. Thank you again for this helpful information! There are things that we have t consider before bringing a Macaw or any Parrot into your life. Size – Macaws are large birds and they need a lot of space. They range in height from 28 to 36-plus inches, with wingspans up to 48 inches. The minimum cage size for a larger macaw is 30 inches deep by 48 inches wide by 60- to 72-inches high. Larger is always betters. Apartments are not good places for Macaws. It’s good to have a separate bedroom just for your bird. Noise – Since they are from the rain forest and need to communicate, they are quite noisy and can screech very loudly especially of they feel they are being ignored or alarmed. Just like people, the need to “talk” varies from bird to bird. Diet – Macaws are fed a diet of fruits, nuts and vegetables. It takes time each day to prepare their meals and chop up all of these foods. Birds are much more sensitive to pesticides than humans. It’s a good idea to by organic pesticide products. Veterinary Care -Not all vets are familiar with birds. It’s important that you find an avian veterinarian but they could be many miles away. Expense – The cost of owning a Macaw is expensive. Your must also consider the cost of the cage and food. Especially if it’s organic. Macaws also need toys to keep them occupied. Their big beaks could keep you replacing their toys frequently. Longevity – This is one of the things my partner and I struggle with. I am in my 60’s and my partner is in his late 50’s. 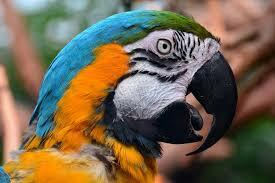 Macaw’s live between 50 and 70 years so they will outlive us. A new caretaker should be agreed upon and documented in the will. A few owners I know have set up trust funds or bought life insurance policies with the bird as the beneficiary, to help the new caretakers with costs. Social considerations – Macaws are social creatures. In your home, they will want to be with the family all the time. Intelligent – Macaws are very intelligent, they are smart, learn fast and learn to mimic. Being that they are social, they like to interact with other people. If they get lonely, they can get destructive or pluck their feathers which could be very dangerous. You need to interact with them frequently. They should not be left alone for many hours at a time. Household Hazards – On the simplest level, Macaws are lungs with feathers. Air quality is a big consideration when bringing them into the home. Many common things cannot be used in a house with macaws: candles; most cleaning and disinfecting products due to their odors; anything treated with PTFE (e.g. Teflon coated pans); stain resistant carpet; cigarettes; and air fresheners. This list is not even complete. Check with your vet for a complete list. Allergies – Bird dander and dust mites may be bothersome to some members of your household. So before making a decision to adopt a Macaw, consider all of these things. Macaw’s are wonderful birds to own but you should be aware of these facts before making your final decision. As you start a new week, we invite you to listen to the best variety of oldies of all time! Edgewater Gold Radio plays the variety you’re looking for. Listen from our new website. Edgewater Gold Radio! It really isn’t that uncommon for a cat to tear a claw. Sometimes their nails get caught especially if they are allowed to grow too long. Both of my cats have gotten claws stuck in something and when I hear a distressful “meow,” I get up and go rescue her. I carefully remove there stuck claw and they are “happy” again. If they tear the claw, a painful injury can result. If you notice your cat limping or bleeding, check her, she may have torn a claw. If the claw is torn down close to the pad or your cat is bleeding, it’s probably a good idea to call your veterinarian. Even if your cat does not seem to be suffering, your veterinarian may suggest coming in for an office visit. You don’t want to risk the toenail getting infected. At an appointment, you veterinarian will likely examine the paw, remove the torn nail, bandage the cats foot and then prescribe a pet medication such as an anti-biotic. We invite you to listen to the greatest oldies of your life from our new website. EDGEWATER GOLD RADIO.COM. We play the largest variety of oldies from the 50s 60s 70s 80s and great pop standards! Check Edgewater Gold Radio our now! As cats age, their joints and hips get stiff just as ours do. If your cat was once able to jump up on your couch but is no longer able to, this may be the cause. At 18 1/2, my cat Molly has a host of medical problems, the medicine in my cabinet just keeps growing. Molly is stiff and sometimes has difficulty with her hind legs. Because of her kidney disease, she has lost muscle mass affecting her front and back legs. I have decided to add Glucosamine and Chondroitin to her medication list. I give .50ml per day and mix it in with her food. My cat Molly has lost a lot of weight and is down to about 61/2 pounds so I give her half the dosage. If your cat is 10 or more pounds, 1 ml per day of liquid Glucosamine and Chondroitin added to her diet may help. We do whatever is necessary to help our little friends! We invite you to listen to the greatest oldies of all time from our new website Edgewater Gold Radio. Add some great memories to your day! 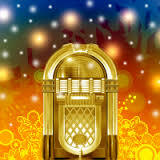 Edgewater Gold Radio plays the best music from the 50s through the 80’s plus great pop standards! Listen and join us in the oldies revolution!